In today’s crowded digital advertising landscape, consumer attention is a much sought-after currency. The question is: Do consumers respond better to quantity or quality of advertising? I’d make the argument for the latter and many of my industry peers agree. Compelling, informative and relevant ad content – the non-interruptive kind — is what matters the most in gaining consumer attention. Granted, the six-second video ad (blink and you’ll miss it) came into vogue at the beginning of 2017 when YouTube/Google showcased their best quickie video ads at Sundance, encouraging more brands and agencies to adopt this “snackable” format. The rationale was that consumers’ attention is so fragmented that advertisers need to pick up the pace to keep them engaged. However, there’s a better case to be made for longer-form advertising that is well-targeted and brings value to the viewer or reader. I had the privilege to speak on a panel on October 2 during New York’s Advertising Week called If Attention is the Currency for Advertising—What does it take to get More? My co-panelists were engaging executives from digital advertising company Acuity, creative agency BBDO and Prudential Financial. Among us the feeling was mutual—quality matters more than quantity and giving more control to the user is paramount in gaining their attention. I shared with the group one of my favorite examples of long-form sponsored content — The New York Times Magazine’s audio podcast that launched in September (to accompany its annual “Voyages” photo essay issue). The audio content was described as a “soundscape ecology project” allowing listeners to hear real sounds of moving lava in Hawaii or bats in Mozambique, for example. GE sponsored this engaging content. This qualifies as an advertising coup in my opinion because as a consumer, I enjoyed the audio so much I actually remembered who the advertiser was! Our panel discussion also revolved around native advertising, another long form approach. I know from experience that consumers look at native ads 53% more than display ads and native ads create an 18% increase in purchase intent. It just stands to reason. If the sponsored content that is surfaced is based on reader interests and preferences, it is way more likely to capture their attention. What’s noteworthy is that non-social native works best. eMarketer recently found that consumers trust information from advertisers on publishers’ sites 24.4% more than on social media platforms, and 69% trust publisher site ads while only 54% trust social platform ads. Let’s not forget that context always matters. If someone is reading a news article, they are probably more disposed to reading another article that is recommended to them (even if it’s sponsored). A more natural content experience that seamlessly integrates into the media that users are already consuming has to be more attention-grabbing. However, if the advertiser allows the user to choose to open the video, it could be 6 seconds, 30 seconds, or 60 seconds. It becomes less about short attention spans and more about earning the right attention with the right people that will actually drive good content experiences, and hopefully, conversions. Consumers are willing to engage with longer content on their phones. 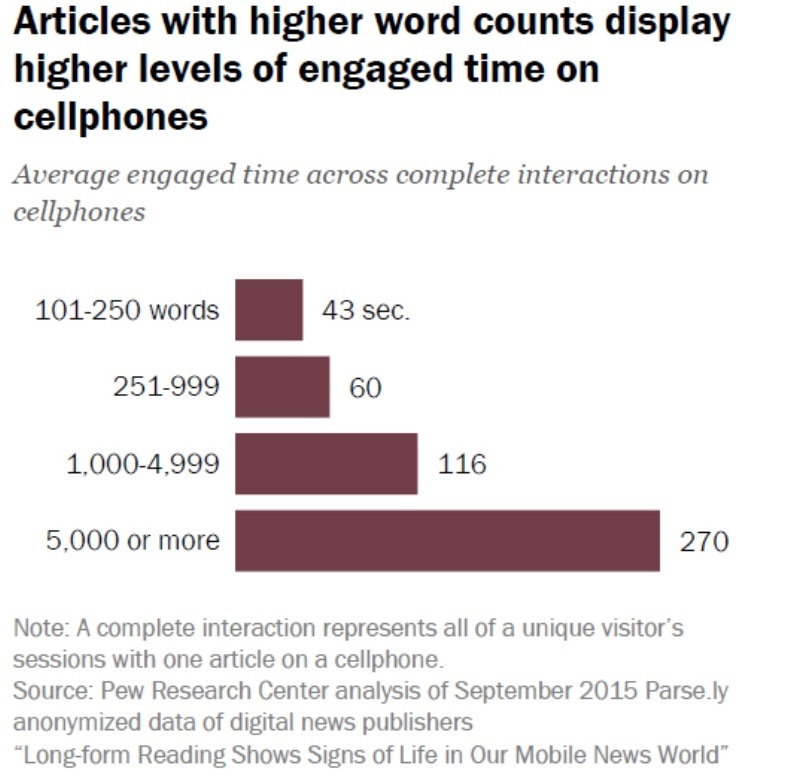 A recent Pew Research study conducted in association with the James L. Knight Foundation and Parse.ly, a web analytics company, found that consumers spend almost twice as much time with long-form stories (i.e., news stories over 1,000 words) on mobile devices than short ones (123 seconds compared with 57). In fact, longer stories attract readers at about the same rate as shorter stories. While a 123 seconds or just over two minutes may not seem so long, it’s longer than most consumers spend with local television news stories. Importantly, the higher word count appears to directly correlate to increased consumer engagement. However, consumption of content, short and/or long can vary based on how the reader came to the article, the time of day, and even by the topic covered. Consumers spend the most time with content in the late night and morning. In late night, consumers spend on average 128 seconds on long-form content and 60 seconds or less on short-form. In the morning, consumers spent 126 seconds long-form and 59 seconds on short-form content. Time spent with long-form content also varies based on how consumers access the content whether it be via a link from an external website, social media, search, etc. 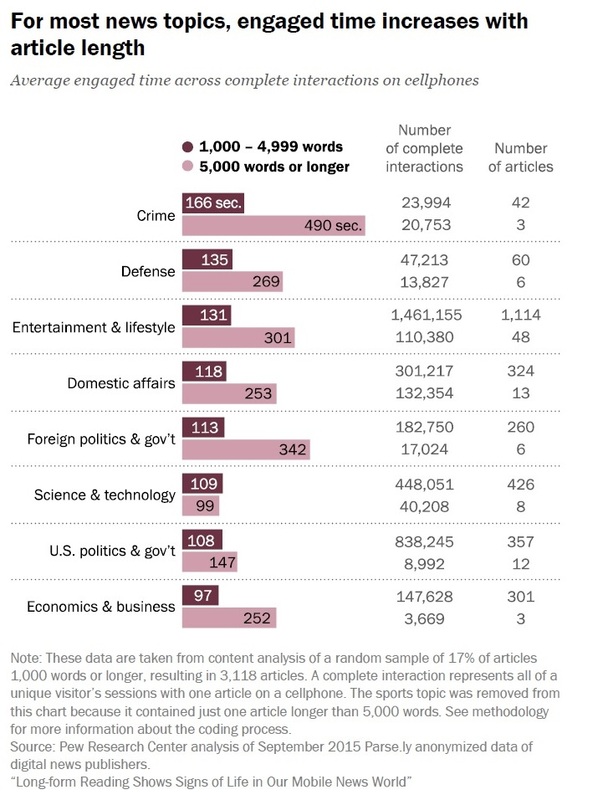 Time spent with long form articles based on entry points appear in ranked order: access via an internal link averaged 148 seconds, visit an article directly or follow an email link averaged 132 seconds, arrive from external website averaged 125 seconds, search averaged 110 seconds and social Media averaged 111 seconds (while lowest in time spent with long-form article, still accounted for greatest share of traffic). Consumers accessing long-form via Twitter spend on average 133 seconds on content where as if they access via Facebook, they spend on average only 107 seconds. The same pattern follows with short-term content. As one may expect news articles, both short and long, have a brief life span. Eight in 10 consumers interact with short form articles within the first two days of publication and 72% interact with long-form within the first two days of publication. Important to note, visitors to long-form articles (28%) are somewhat more likely to view multiple articles on a site than visitors to short-form articles (22%). However, long-form reading does not necessarily develop site loyalty. The research further identified the most popular long-form content on cellphones. Consumers read long stories on crime, foreign policy and government and entertainment and were also more engaged as the story lengthened. Content on mobile does not need to limit itself to short-form. Mobile offers publishers a strong outlet for long-form content allowing for more sources, more points of view and additional context.